50 Hits of Polka Music by Many Different Artists on 2 CDs! 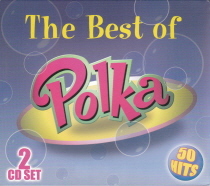 The Best of Polka is a 2 CD box set with 50 Classic Hits! Yes 50 Songs on 2 CDs. If you are looking for many of the great bands of the band, here is a fine set of music!